To be honest, however, I was not quite sure what to expect from the fellowship since although the website listed topics of learning, it was not specific on what workshops or trainings would be exactly offered. 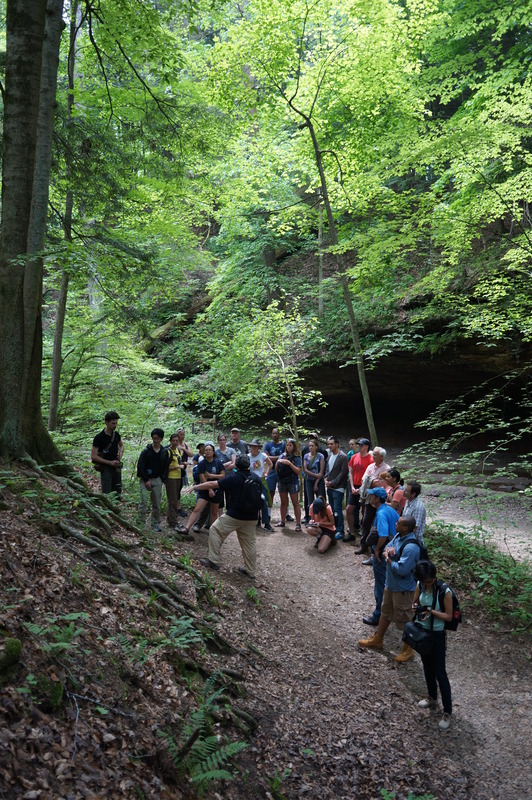 Even more than a month after leaving the fellowship site in Turkey Run State Park in Indiana, I am still complementing many of the insights and experiences that I gained while at Byron. However, I will attempt to describe some of the workshops that I participated in over the course of the week. 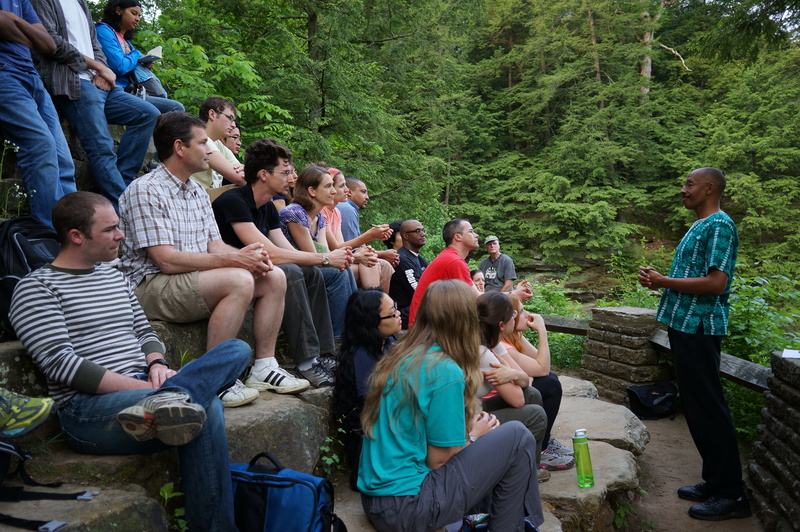 The theme of Monday, the first full day at Byron: engaging place/ natural systems models for sustainability, included a mindfulness training, a workshop linking spirituality and nature, and a hike to learn about the geology, hydrology, and fauna of the place we were spending the week. I much appreciated the emphasis on mindfulness and spirituality in sustainability, as I feel that this is an often overlooked aspect for many people working for social justice, myself included. Incorporating mindfulness into my work, especially being mindful about how many projects I commit myself to, is something I had been trying to do especially since attending a Stone Circles retreat (an awesome resource and place for people interested linking spirituality and social justice) the previous year. 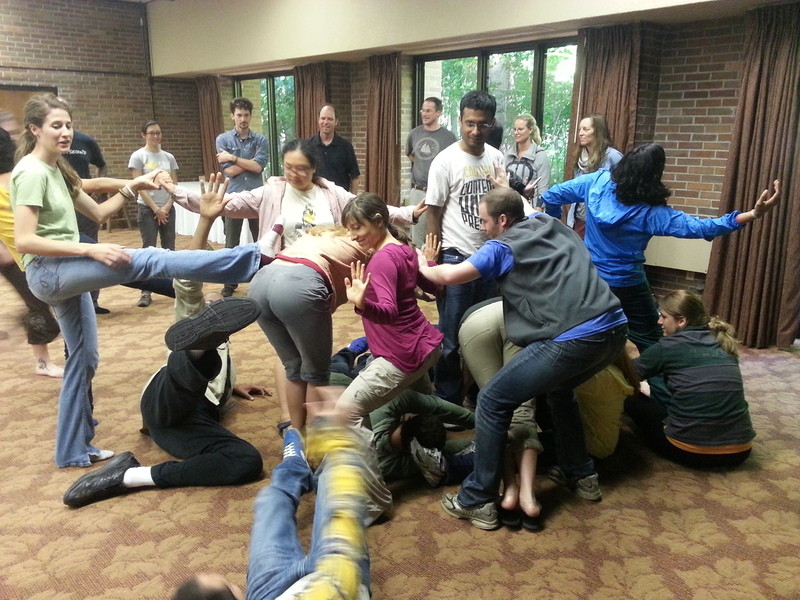 One of our mentors also led us through lots of fun movement exercises that also served as team-building exercises. The theme of Tuesday: engaging culture, included three site visits: first to a modern farm production facility, second to a Quaker farm, and third to an intentional community. I had high hopes for the visit to the intentional community since one of the projects that I am working on in DC is with a group trying to start an ecovillage in DC with the goal of fostering healthy food systems and communities via collective ownership of housing and enterprises. However, upon arriving at the Lakeside Village of Byron, I quickly learned that the vision that I had in mind for an intentional community was very different than the one that I was being presented with. I was informed by our guide that these houses were primarily marketed and sold as weekend and second homes for families. To me, that immediately signaled a red flag. How could the community be marketed as an intentional community if most people did not even live there the majority of the time? Additionally, how diverse could the community possibly be if people had to have enough surplus income to afford to buy a second home? And finally, how could purchasing a second home, with all the extra resources and materials required as well as gas to travel between homes, even be considered environmentally friendly? All three aspects, social, economic, and environmental equity of sustainability seemed suspect to me. If the homes were just marketed as lakeside houses, I would not have found them as problematic. But the fact that they were marketed as an intentional community with sustainability in mind, when that seemed to be quite different from my understanding of intentional communities struck a deep chord with me. I had serious doubts about the diversity of a community that could only be limited to those with enough wealth to afford a second home. As an American-born Chinese who grew up on Long Island, New York not knowing many other Asians, I did not always feel like I fit in. Instead of being proud of and embracing my Chinese heritage, culture, and language, I felt embarrassment for being so different. The irony, of course, is now that I am older, and somewhat wiser, I am desperately trying to re-learn the many aspects of my Chinese identity that I shoved aside as a child. Thus, for me, diversity is of critical importance to creating a community where I would feel comfortable living in and would serve as a place where everyone would feel welcome, regardless of their background. Thus, when it came time for the Byron fellows to discuss our reactions to the three sites, I brought up my concerns about the intentional community. Unbeknownst to me, the founder of the Lakeside Village was actually in the room when I voiced my concerns and the mentors decided that it would be a great learning opportunity if the two of us discussed this in front of everyone. When the mentor said this, I felt a rush of nervousness. Already, earlier in the week, I had been reminded by the same mentor that I had a tendency to speak too fast and that it was hard to understand what I was saying. Public speaking had never been my forte growing up, and while I felt I had gotten much better over the years, I felt unprepared to speak in this sort of context. However, I walked to the front of the room and sat down next to the founder. I started to express my concerns about the intentional community and actually discovered that he was largely agreeing with me and actually wanted my help in making the community more diverse! I was surprised by how well the conversation went, but still felt a huge sense of relief when it was over. Afterwards, several people came up to me and thanked me for initiating such a difficult, yet important, conversation. When one is always in the minority, it can be difficult to feel that you have the support that you need to speak up. While I was glad that I sparked the conversation, this experience strongly reminded me of why I want to create a community that will be diverse from the start so that people do feel that they can openly share their opinions and ideas. To be continued.. when I return to DC and facilitate a workshop about diversity at the DC Ecovillage gathering in June! What are your thoughts about the importance of diversity in sustainability work? Join the conversation on facebook! Author: Josephine Chu is a program leader with Cultivating Intergenerational Leaders, the Summer of Solutions program based in Washington, D.C. This entry was posted in Local Programs, Summer of Solutions and tagged Byron Fellowship, diversity, Ecovillage, intergenerational, Josephine Chu, Lakeside Village of Byron, place-based learning, Stone Circles Retreat, Sustainability, Washington DC by tennistrc9. Bookmark the permalink.